As promised, two of the many recipes from tapas at Phil’s. 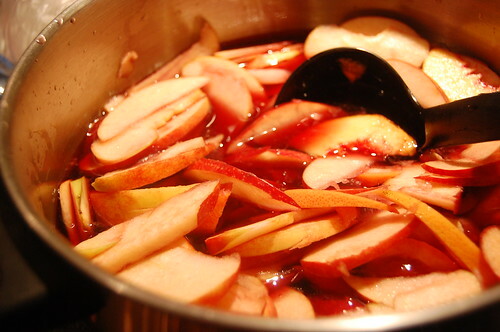 Combine all ingredients in a pitcher or large punch bowl and refrigerate for at least 2 hours, preferably overnight. Serve with ice. These are a classic tapas dish in Spain, and as with anything involving potatoes and extra virgin olive oil, they are so delicious without the heaviness of something deep-fried. Really easy to make too. They’re traditionally served with a spicy tomato sauce and/or allioli, the garlic mayonnaise. 16 small red potatoes, quartered. Leave skins on. Preheat the oven to 425 degrees. Put the potatoes in large pot and cover by 2 inches of water. Bring to a boil, and then turn heat to medium. Leave for about 20 minutes, until potatoes are fork tender. 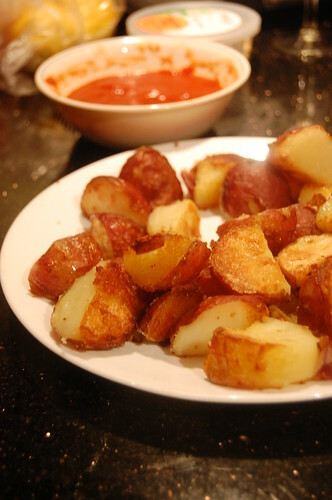 Transfer potatoes to a baking sheet, toss with the olive oil and salt, and spread into one even layer. Bake for about 45 minutes, or until golden brown. Serve with tomato sauce. Combine to personal taste and heat. This is something special to try in the weekend. Great taste of fruits and lemon. I am definitely going to try this. You are currently reading Straightforward sangria and crispy patatas bravas at Notes on Food.